Born to business-owning Holocaust survivor parents, David Stern learned early the value of freedom and how to achieve it through sales. He began practicing his sales skills as a teenager, and now after more than forty years in sales, he coaches others to freedom through selling. 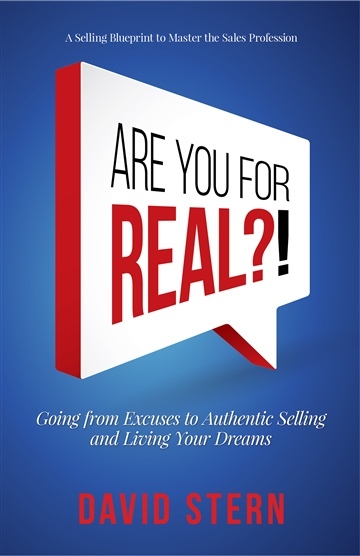 At the heart of his sales philosophy is the question, “ARE YOU FOR REAL? !” This question embodies the essence of selling—the need to be honest, authentic, and confident. No more layoffs, tyrannical bosses, or the 9 to 5 grind. Freedom awaits you, and it begins by saying “Yes” to sales and getting real with Coach David Stern. “I love selling, and I believe the business of selling brings freedom - it allows you to live your dreams. But, you need to understand every aspect of the business,” says sales coach David Stern, a highly successful salesman with a 40-year career. “I love to help people reap the benefits of this career path. Stern is an esteemed sales coach who brings over forty years sales experience to each coaching session. His methodology combines from-the-field wisdom, insights on interpersonal dynamics, perspectives on self-development, and systematic evaluation methods to forever change the selling career of others. He works one-on-one using custom client programs that yield real results. Award-winning New York publisher Aviva Publishing has published his inspiring sales career survival guide in June of 2015. “My programs are tailored around exploring the full perspective of the business,” he explains. “I’m into the basics, for instance, goal setting, time management, database management, and constantly building your client base. I also prefer to review and explore in depth the six steps of selling. One other thing I strive to do is get my clients out of their comfort zone so they can achieve more than they thought possible.” In addition to these pragmatic tools, the foundation of Stern’s work is belief: belief in the value of the work, and the value of the self. “When you meet sales superstars they exude this quiet confidence,” Stern says. “Lack of confidence holds people back. I can help you, but you have to be willing to make changes within yourself. "Success in this business comes down to awareness, self-acceptance, self-development, communication, belief in yourself and the service you provide, and most importantly, it comes down to being honest and caring."